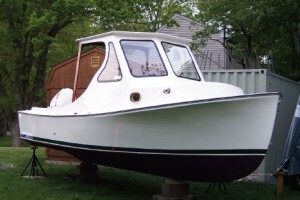 A 1984 boat renews one man’s love for the water, and he returns the favor with a complete restoration. Seventeen years ago Roland Robert bought a 7-year-old pocket cruiser powered by a sterndrive. It didn’t take him long to regret it. He parted with the 25-footer in 1994. And for more than 15 years Robert, 59, who lives on the Taunton River in Berkley, Mass., was unwilling to buy another boat. “It put a bad taste in my mouth,” he says. A yearlong restoration gave Roland Robert’s 26-year-old Sisu 22 a new lease on life. On a trip to Maine in January 2009, Robert got a glimpse of a restored Duffy 26. The classic lines of the New England-style lobster boat — plumb bow, sloping sheer and tall framed windshield — revived his interest in boat ownership. “[It] got me all charged up about looking for a small Down East boat,” he says. Robert found one a few months later — a 1984 Sisu 22, designed by Royal Lowell and now built and sold as the Lowell 22 by the Lowell Brothers in Yarmouth, Maine and as the North Shore 22 by Grey Barn Boatworks in Newton, N.H. “I’ve always been fond of the Sisu, ever since I saw one for the first time 20 years ago,” Robert says. Robert, a machinist, and his sons Jason, 37, and Derek, 34, recently completed a yearlong overhaul of the Sisu, stripping and repainting the hull, replacing the fuel tank and steering system, and designing and building — from scratch — a hardtop with front and side windshields and a starboard-side helm console. 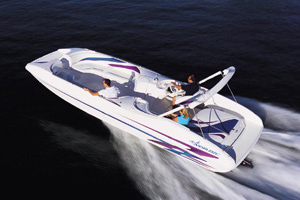 They removed the 1989 150-hp Mercury 2-stroke and repowered the Sisu with a new 115-hp Evinrude E-TEC, a direct-fuel-injected 2-stroke. Robert worked on the Sisu just about every weekend and weekday evening from late May 2009 until her launching on Memorial Day weekend 2010. 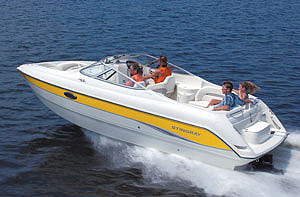 New 22s today run between about $40,000 and $65,000 depending on the builder, power (inboard or outboard) and other options. 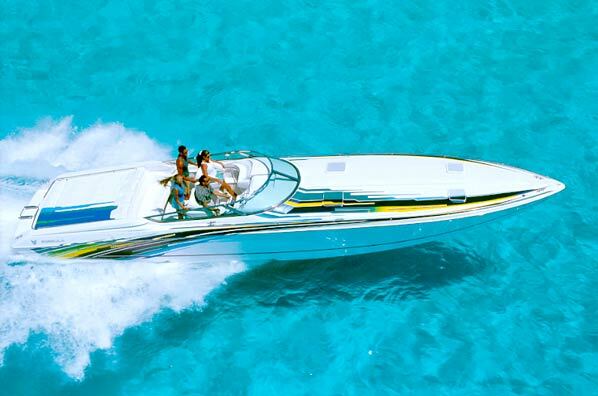 Sisu Boat Inc., of Portsmouth, N.H., built the Sisu 22 and 26 in the 1970s and ’80s. Sisu closed in 1988, and William Colbert at Grey Barn Boatworks has the molds for the 22-footer. Lowell Brothers bought the other molds in 2004, and the boatyard offers the semidisplacement boats as the Lowell 22 and 26. 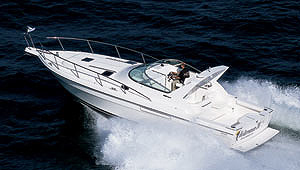 With its fine entry and narrow forefoot, the 22 is known for its seakindly ride. The deep forefoot makes it a stellar wave slicer, but it also adds buoyancy, Lowell says. “When that boat’s running and you come down into a sea, you’d have to work really hard to put the bow under the water,” Lowell says. The boat tracks well thanks to its full keel, and its fairly tight bilges provide stability, Lowell notes. Robert has taken a couple of 26-mile runs from Berkley to Newport, R.I., and the Sisu has performed well in Narragansett Bay’s choppy waters. He has logged about 60 hours on the Evinrude this season. The upgrades included new hydraulic steering and a new plastic fuel tank. Robert and his sons spent hundreds of hours refitting the Sisu. The toughest part was coming up with a hardtop and windshield design, building it and finishing it off, he says. Robert tried to find a way to work with the original windshield frame but decided to replace it, which meant he and his sons had to design its replacement. They built the structure out of Penske board — a composite core material — sandwiched in fiberglass. Their initial design included side windshield framing or mullions that were too wide, and Jason Robert thought it probably would impede visibility. 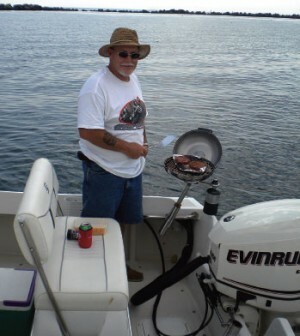 Robert launched the boat on Memorial Day weekend of 2010 and enjoyed his first season with it. The underside of the hardtop was built with fore-and-aft wiring chases. Robert cut PVC piping in half lengthwise and glassed it inside the hardtop. He also rabbeted out channels in the windshield frames for placement of the tempered glass. (He had a glass shop cut the shapes and install the windshields. )The Penske board is lighter than wood but not as stiff, so Robert built two mahogany support posts and positioned them under the aft corners of the hardtop. He also installed a mahogany bow pulpit and companionway door frame, encapsulating the wood in MAS epoxy and finishing it with polyurethane. His skills as a machinist also were put to use. 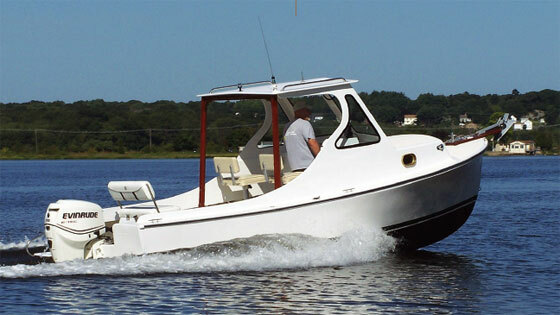 Roland fabricated all of the hardware, including the cleats, a handsome Sampson post, and the helm and companion pedestal seats and the two-person transom seat. Despite its age, the Sisu’s hull was in pretty good shape, Robert says. Sisu built the 22 with a fiberglass bottom and used balsa wood as a coring material for the sides and decks, Lowell says. Robert found some wet core on the starboard gunwale cap. He removed the rotted wood and replaced the 12-by-6-inch area with solid glass. The previous owner told him that the transom had been rebuilt, which was confirmed when he and his sons raised the transom from 18 to 25 inches — again using Penske board and fiberglass. “I drilled here and there to begin adding to the transom, and it looked solid and dry and tight,” Robert says. Replacing the fuel tank on an older boat can be a nightmare. Many aluminum tanks were encapsulated in foam to hold them in place, and the foam makes it difficult to remove the tank. Foam also captures moisture and leads to corrosion. The Sisu’s 40-gallon tank — on centerline and forward in the cockpit — was corroded, but there was no foam around it. 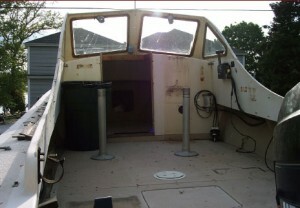 And sections of the boat’s screwed-down deck can be removed for complete access to the bilge. Robert says the toughest part of the project was designing and fabricating the hardtop and windshield. The men also built platforms in the bilge for the 2-stroke’s oil tank and two batteries. 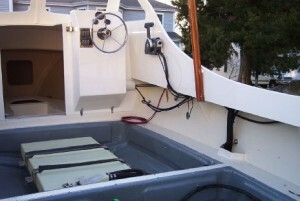 They installed a hydraulic steering system, and Robert designed and built a starboard-side helm console that tilts aft on hinges to provide access to the wiring. 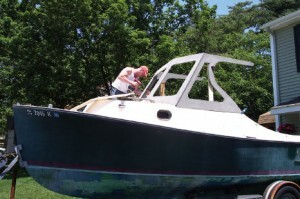 Jason has a friend who owns an auto body shop in nearby East Providence, R.I., where they primed and sprayed the boat with Alexseal paint products. 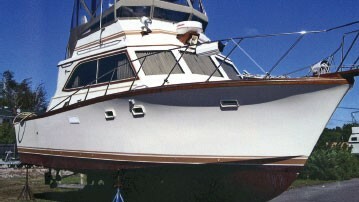 The hull is white with a green boot stripe and black bottom paint. They coated the decks with an off-white non-skid, also from Alexseal. Robert says he found a 115-hp E-TEC for $9,900 installed. The engine has mechanical controls and analog gauges. The helm gauges lack a fuel-burn display, but he figures he gets about 5 nautical miles to the gallon at about 20 knots. 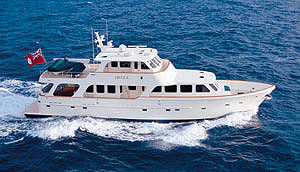 The E-TEC pushes the Sisu’s semidisplacement hull to a top speed of about 28 knots, and she cruises from 13 to 20 knots. The Roberts removed all of the electronics, which included an Apelco radar, a Si-Tex depth sounder and a VHF radio the “size of a VCR player,” Robert says. 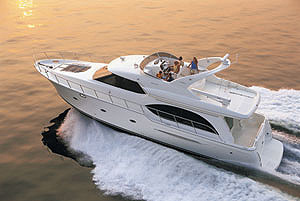 He has outfitted the boat with a Garmin 541s GPS/sounder, a Standard Horizon Eclipse VHF and a Ritchie compass. The only part of the boat that has remained unchanged is the cabin. “It’s in really good shape, so I haven’t touched it,” he says. Chris Landry is a staff writer for Soundings Magazine. This article originally appeared in the November 2010 issue.